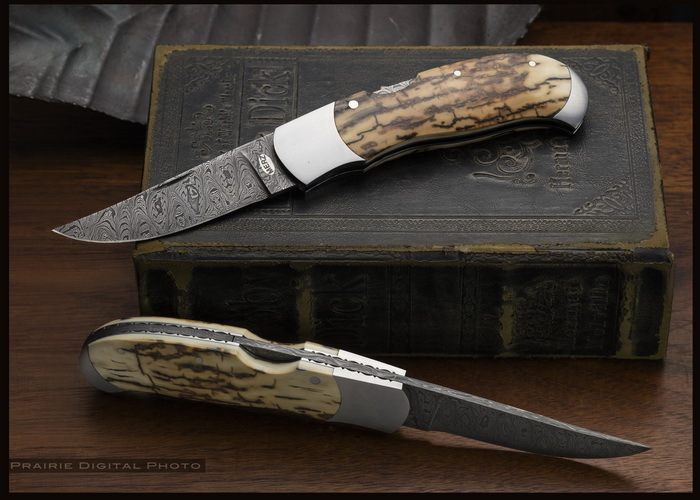 Robert Merz has crafted an elegant lockback with a 2.875-inch blade of Mike Norris Ladder Pattern Stainless Damascus. The handle features Mammoth Ivory with 416 Stainless bolsters. The lock bar and backspacer are Damascus and the stainless liners are fileworked by Merz. The folder is 4 inches closed, 6.875 inches open. I have been making knives since the early 70’s and have been a member of the Knifemaker’s Guild for over 20 years. As a custom knife maker I have made hundreds of different styles of folding and straight knives. Although I focus most of my time on the design and production of folding knives, I do occasionally make straight knives. I will work with customers to design knives meeting their particular tastes and needs. My knives are owned by hunters, collectors, law enforcement and military personnel around the world. Each knife is individually hand made from the finest materials available.